Maureen Connolly Brinker Tennis Foundation: Special Commemorative "Little Mo" Stamp is Announced by the United States Postal Service! Special Commemorative "Little Mo" Stamp is Announced by the United States Postal Service! Special Commemorative "Little Mo" Stamp Announced! 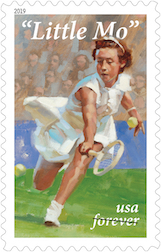 The Maureen Connolly Brinker Tennis Foundation (MCB) is proud to announce that the United States Postal Service will be issuing a special commemorative "Little Mo" stamp later this year. The First Day of Issue Stamp Dedication Ceremony will be Tuesday, April 23, 2019, at 11:00am in Dallas, Texas. More details to follow.